While we are still awaiting for the Nike Kyrie 4 to arrive in stores, we are now seeing some crazy colorways that might (?) reach retail. 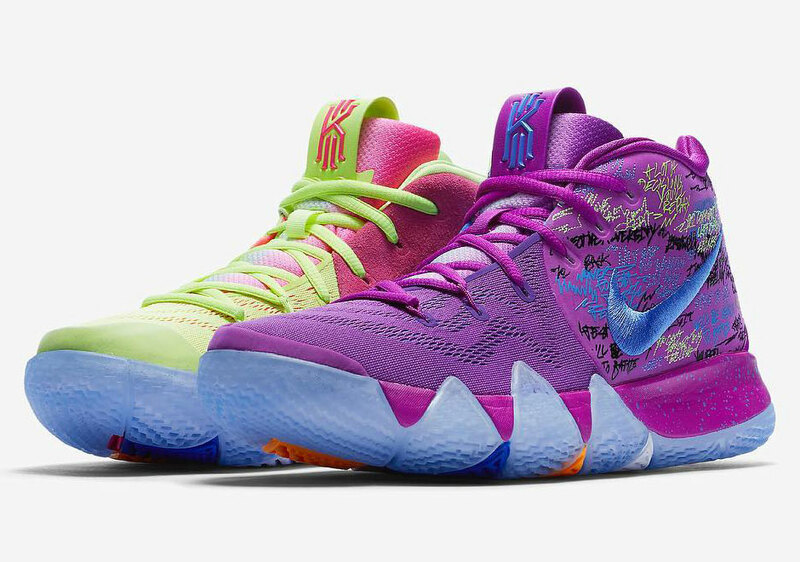 This one is a multi-colored version of the Kyrie 4 and some might even call this as one of those "What the" series that span across various basketball lines. But since there is no official name for this specific colorway yet, then let's just call this a multi-colored version of the Kyrie 4. The colors differ between the left and the right shoe. The left pair is themed with purple and blue while the right pair in volt and pink. The shoe features an engineered mesh-like material in the forefoot with a suede-like material in the ankle area. Some of the design details that can be seen in this particular image is the inscriptions in the ankle area with and embroidered logo. An icy blue translucent ouotsole was used with colored solid rubber sections underneath. While the Kyrie 4 is scheduled to drop this second half of the month, let's wait for more details if when this colorway will release.